Mexican President Enrique Pena Nieto has cancelled a planned meeting with President Donald Trump. News of the cancellation comes on the same day that a Trump spokesman suggested the president will seek a 20 per cent tax on Mexican imports to pay for a proposed border wall. 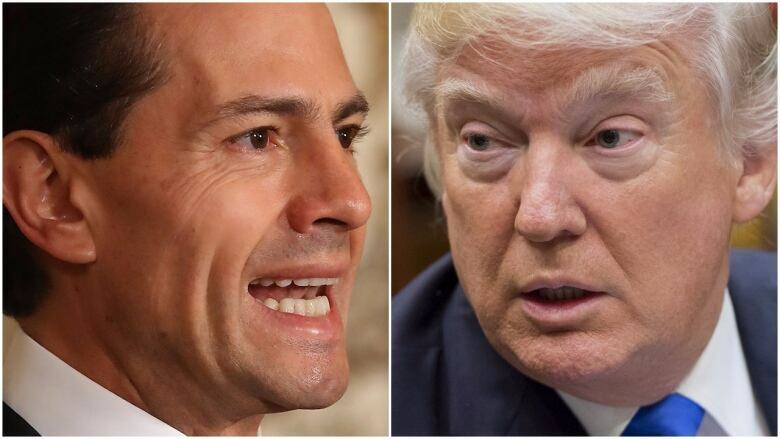 Mexican President Enrique Pena Nieto has cancelled a planned meeting with U.S. President Donald Trump. News of the cancellation comes on the same day that a Trump spokesman suggested the president will seek a 20 per cent tax on Mexican imports to pay for a proposed border wall. Thursday's events signalled a souring of relations between Washington and one of its most important international partners just days into the new administration. The rift capped days of increasingly confrontational remarks — on Twitter and in duelling public appearances — between the two men, whose countries conduct some $1.6 billion US a day in cross-border trade, and co-operate on everything from migration to anti-drug enforcement to environmental issues. OPINION:How do you negotiate trade if facts don't matter? Hours after Trump tweeted that the meeting should be scrapped if Mexico doesn't agree to pay for a wall along the nearly 3,218-kilometre border, Pena Nieto responded via the same platform. "This morning we have informed the White House I will not attend the working meeting planned for next Tuesday," the Mexican president tweeted in Spanish. He added that "Mexico reaffirms its willingness to work with the United States to reach agreements that benefit both nations." Esta mañana hemos informado a la Casa Blanca que no asistiré a la reunión de trabajo programada para el próximo martes con el <a href="https://twitter.com/POTUS">@POTUS</a>. In a speech later Thursday, Trump doubled down on the dispute, saying that "unless Mexico is going to treat the United States fairly, with respect, such a meeting would be fruitless, and I want to go a different route. We have no choice." Trump also claimed that calling off the meeting was a mutual decision and floated a new possible threat to Mexico, which sends about 80 per cent of its exports to the U.S. and which has vowed not to pay for a wall. "We're working on a tax reform bill that will reduce our trade deficit, increase American exports and will generate revenue from Mexico that will pay for the wall, if we decide to go that route," Trump said. On the flight back to Washington, Trump's spokesman told reporters the president was considering the 20 per cent import tax to foot the bill, the most specific proposal Trump has ever floated for how to cover a project estimated to cost between $12 billion and $15 billion. Trump's 'great wall': How much will it cost? Who's paying? "By doing that, we can do $10 billion a year and easily pay for the wall just through that mechanism alone," Spicer said. "This is something that we've been in close contact with both houses in moving forward and creating a plan." Spicer said Trump was looking at taxing imports on all countries the U.S. has trade deficits with, but he added, "Right now we are focused on Mexico." But the announcement sparked immediate confusion across Washington, and the White House tried to backtrack. 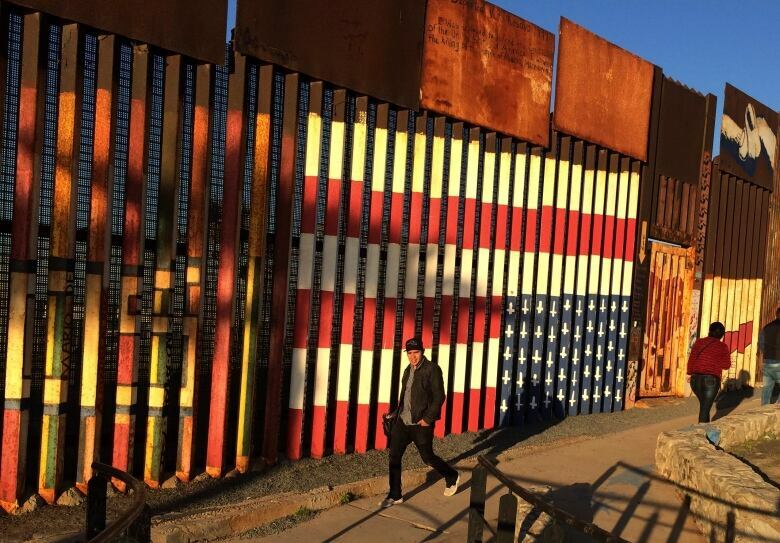 During a hastily arranged briefing in the West Wing, Chief of Staff Reince Priebus said a 20 per cent import tax was one idea in "a buffet of options" to pay for the border wall. A 20 per cent tariff would represent a huge tax increase on imports to the U.S., raising the likelihood of costs being passed on to consumers. Half of all non-agricultural goods enter the U.S. duty free, according to the office of the U.S. trade representative. The other half face import tariffs averaging two per cent. Mexican Foreign Relations Secretary Luis Videgaray said Thursday, "A tax on Mexican imports to the United States is not a way to make Mexico pay for the wall, but a way to make the North American consumer pay for it through more expensive avocados, washing machines, televisions." Trump has also pledged to renegotiate the North American Free Trade Agreement (NAFTA) with Mexico and Canada. Mexican officials have expressed willingness to update the pact, but said they would consider walking away from NAFTA if negotiations mean making too many concessions. Mexico is one of America's biggest trade partners, and the U.S. is the No. 1 buyer from Mexico, accounting for about 80 per cent of Mexican exports. 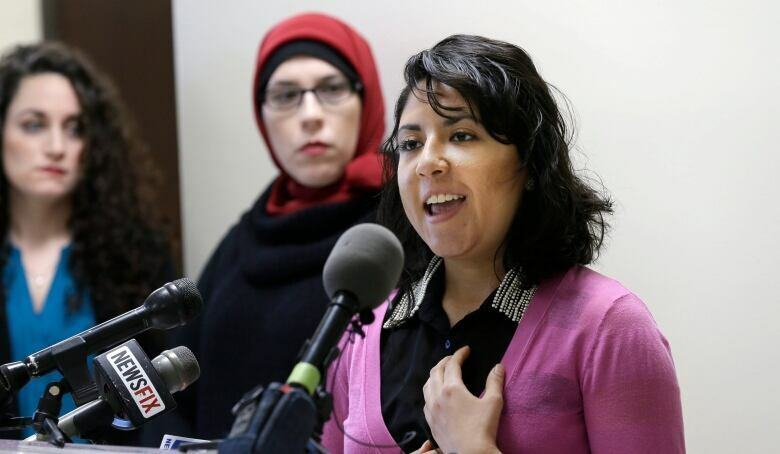 Many U.S. Muslim and Latino advocates have joined forces in opposing changes to immigration rules by Trump, bolstering an alliance between them as they mull the prospect of aggressive restrictions. In joint press conferences and rallies across the country, they are decrying an action Trump signed to jump-start construction on a southern border wall. Trump is expected to take steps to stop accepting Syrian refugees, suspend the United States' broader refugee program for 120 days and suspend issuing visas for people from seven predominantly Muslim countries in the Middle East and Africa. "An attack on one of us is an attack on all of us," said Greisa Martinez, an advocacy director of the United We Dream Network, describing herself as "undocumented, unafraid and here to stay."